Top Knobs just launched its new online digital selection tool. With so many knobs and pulls to choose from, sorting through hardware can seem daunting. The Find Your Style tool, available on TopKnobs.com, eliminates that stress by transforming the hardware selection into a personalized design experience. Top Knobs' Find Your Style digital selection tool makes choosing the right style, finish and size easy and fast. It offers users a uniquely creative opportunity to explore designs and finishes that reflect personal style. The innovative tool also makes it possible to identify sizing options to meet specific design needs. Through this comprehensive digital tool, customers are guided through a short series of questions to identify product offerings based on individual preferences and needs. Once the short Q & A is complete, a narrowed down selection of products is recommended to the user. Customers can then export the list and share their selections with designers and/or showroom consultants to help expedite the design process. 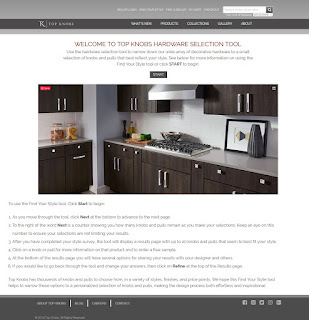 The Top Knobs digital selection tool is available on Top Knobs’ home page or can be accessed directly at https://www.topknobs.com/style.